WASHINGTON CITY – Traffic stalled for a short time Sunday morning near the intersection of 700 W. Telegraph Street in Washington after the wheels of a semitrailer rolled over the hood of a car when the driver reportedly made too sharp of a turn. Just before 11:30 a.m., a man and his wife, traveling in a Toyota Avalon, were heading east in the parking lot near Chase Bank, Washington City Police spokesman Ed Kantor said. After the car stopped at the stop sign, a semitrailer, traveling north, began making a left-hand turn to head west, misjudged the turn, and clipped the front-end of the Avalon, Kantor said. 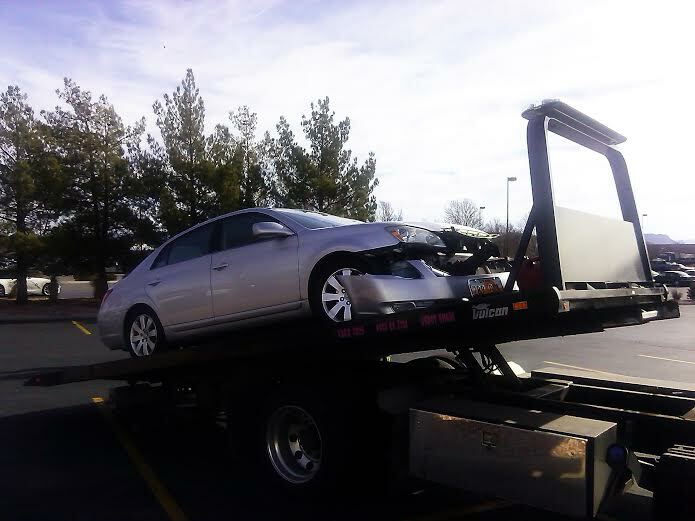 The driver of the Avalon, John Day, of St. George, said that when he saw the angle the semitrailer was headed toward him, he tried to put the car in reverse and get out of the way, but it was too late. When the collision occurred, Ronnie Morales, of St. George, said she was standing on the curb, just a few feet away, sipping on a cup of coffee. Washington City Police and Washington City Fire Department responded to the scene. Traffic was stalled for a short time while the vehicles were moved out of the roadway and the Toyota was towed from the scene. No citations were issued because the collision happened in a parking lot which is private property, Kantor said. Clicker on photo to enlarge it, then use your left-right arrow keys to cycle through the gallery. Sounds to me like a couple of people not paying attention. If the Toyota driver was pulled out so far the semi couldn’t make the corner, that was not real smart. If the semi driver couldn’t see what was going to happen, that wasn’t real smart either. Just goes back to the rudeness and self-centeredness of some drivers here. “If the Toyota driver was pulled out so far the semi couldn’t make the corner, that was not real smart.” And if the driver actually plowed into the truck going 90 mph that was not real smart either. But no where in the article does it say either thing happened. Some things can be inferred by reading the rest of the story. At least for anybody with a modicum of intelligence. Every time you post, no matter what name you are using, your lack of maturity and common sense just screams out. Why don’t you go play – in traffic. The wheels of the semi go round and round, round and round, round and round. The wheels of the semi go round and round, all over the Avalon. was it a good ol’ local boy or a long-haul trucker? Does this mean they don’t issue citations or make arrests for DWI in a parking lot because it is private property? REALLY! Meagan, there are two things that you can be cited for on private property, DUI and reckless driving. You can get an DUI anywhere in Utah. How about parking in a handicap spot? Or just parking in the aisle when your sober than a church mouse? Distracted driving by truck driver. I hope Ms. Morales was misquoted. Perhaps the driver’s wife was the one shrieking. Be purdy embarrassing otherwise. Hey Idget, quit picking on the baby. You might make him cry and fill his diaper all at the same time! Besides, he is MINE to mess with. I own him, and have for a very long time. Well good for you. Now then, if you can just figure out your b*** from a hole in the ground. . .
Oh yeah, I own you by ALL of your aliases, silly boy. Why would a truck driver be pulling into a mall parking lot are the dumb. Trucks are always a pain, they are dangerous and plug the freeway. They burn up the ozone. They’re horrible…..never mind I remember now. They only way we get food, cloths, fuel, home supplies, cars, or any other needed comodity comes by truck. And they trucking industry IS NOT subsidized by the government. That can’t be said for the companies of airlines and the trains, both of these industries cost the tax payers billions. So keep up the good work truckers keep America and old Santa Claus moving. Just pay attention while your driving.